Staying fit means not only building up a sweat on the outside but knowing how food affects you on the inside. 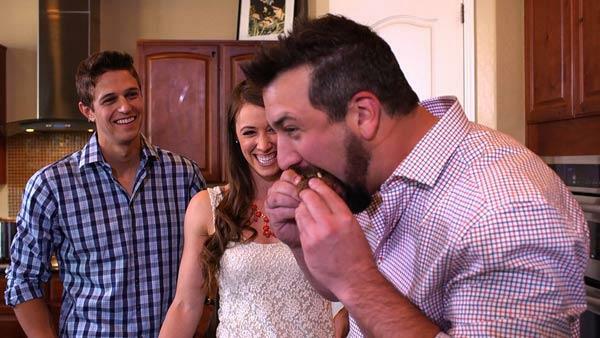 Joey Fatone gets the inside scoop on the hottest fitness and diet crazes -- CrossFit and the Paleo diet. Combining the popular workout with the diet can lead to amazing results. Matt Lucas and Audrey Barbera, a recently engaged couple from Tempe, Arizona, are the definition of fit. They are the proud owners of a CrossFit gym and they are dedicated to a diet known as Paleo. "Despite some of the myths about it, it is not very extreme. We are not living in a cave," said Matt. "Anybody can do it. Start with meat and vegetables and mixing and matching one or two spices." Paleo basically refers to the kinds of foods that would have been available to cavemen during the Paleolithic era long ago. Eating Paleo foods includes meat, fish, chicken, nuts, seeds and bacon. While staying away from sugar, diary and anything processed, the main focus is that you eat things that are whole and natural. With results like these, Joey was happy to give it a try. "When people first try Paleo, we try to get them off on the right foot so we use a lot of crowd favorites and when they realize that cooking this way tastes good, it is nice to see their eyes light up and the fact that it is nice and simple I think lets them know they could do this on a day-to-day basis," said Matt. Matt owns Free Range CrossFit in Tempe, Arizona. CrossFit is a strength and conditioning program that focuses on general physical preparedness. It combines elements of gymnastics, weightlifting, running, sprinting, rowing and climbing -- basically anything that uses your body in a functional way. Matt's recipe for Pumpkin Sausage Soup came from a website that he runs called TheFoodee.com, which aggregates the best Paleo recipes from different bloggers. Audrey showed Joey how to make her Cilantro Lime Chicken. She rubbed the meat with a homemade spice mixture and fried them in a skillet before baking them in the oven. Eating Paleo does allow you to take part in some sweet temptations so Audrey whipped up a batch of Coconut Macaroon. Joey loves bacon so he came up with the idea to experiment by adding bacon to the macaroon mixture. The Bacon-Roons turned out to be a delicious treat that combined sweet and salty flavors. The Paleo style meal continued when Matt made a tasty and healthy substitute for rice. Since a Paleo diet doesn't consist of processed foods, he turned cauliflower into a dish that looks just like rice by grating the vegetable. Then, Matt made a killer barbequed carrot that is extremely easy to do. Since we usually eat with our eyes first, he wisely used a variety of colored carrots. It gave this dish a nice presentation. "You do feel better and I think it shows. You notice it when you sleep, how you workout and complete day-to-day activities. No more bloated, I'm too full feeling. You eat until you are full and that's enough. As I go back and eat things from my childhood, I'll see just how crummy I feel afterward so it is easy to use those as buffers," said Aubrey. Finally, the couple topped off their meal with a quick and easy spinach salad with avocado, pear and bacon. Joey learned that eating a healthy Paleo diet doesn't mean you have to sacrifice flavor. For more Paleo and primal friendly recipes visit thefoodee.com. Matt Lucas' recipe for Pumpkin Sausage Soup came from a website that he runs called TheFoodee.com, which aggregates the best Paleo recipes from different bloggers. Audrey Barbera shares a recipe for Cilantro Lime Chicken, which is rubbed with a homemade spice mixture. Eating Paleo does allow you to take part in some sweet temptations. Try whipping up a batch of Coconut Macaroon. This recipe is a tasty and healthy substitute for rice. Since a Paleo diet doesn't consist of processed foods, you can turn cauliflower into a dish that looks just like rice by grating the vegetable. This killer barbequed carrot recipe is extremely easy to make and perfect for a Paleo diet. This quick and easy spinach salad is topped with avocado, pear and bacon. Go behind the scenes as Joey Fatone checks out the Free Range CrossFit in Tempe, Arizona.